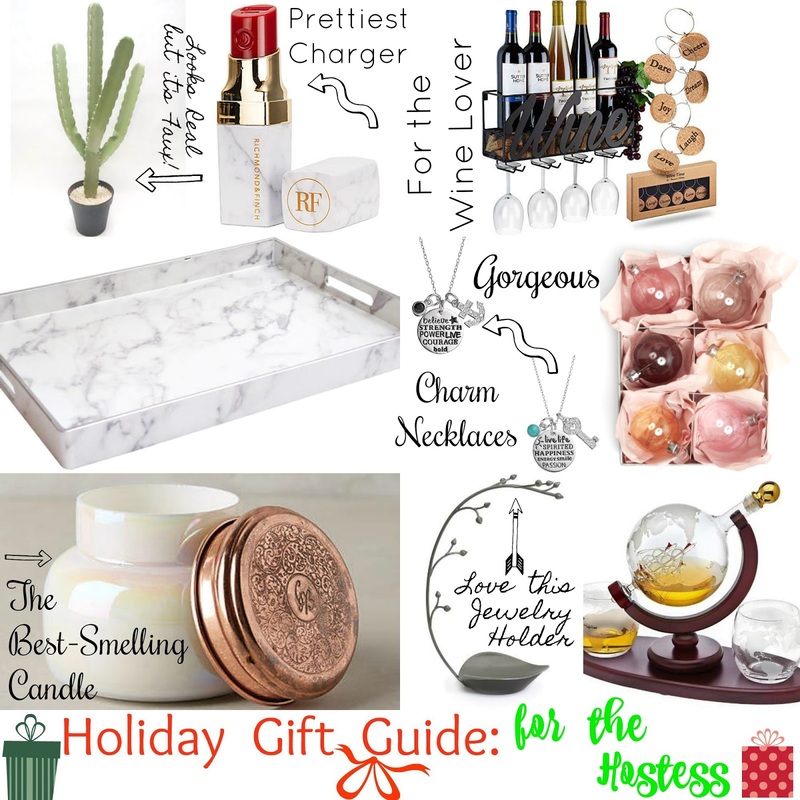 Holiday Gift Guides 2018: Gifts for the Hostess. This is the 3rd gift guide I am doing and in many ways it is the hardest one and I will tell you why. At this time of the year we are invited to many Holiday and Christmas parties, at our friends', family members, co-workers' homes, etc. It is very important that you do your job as a guest and bring something to the person who invites you. Even more importantly, for the host or hostess of the party. These gifts may be hard to shop for or select because you don't want them to be or feel too expensive or too personal. I think decorative things like candles, plants, a frame, a photo album or a framed art piece are a good idea. Ditto for a set of glasses, a bottle holder like a wine holder, boxed chocolate, etc. I think I came up with the perfect 9 gifts for the hostess and everything is under 70 bucks, too. Let me know if you agree with my choices. Faux Plant - A plant is always a great idea to bring to a host/ess. A real one would be nice, but there are so many gorgeous faux plants out there. Like this cactus plant. It looks so real but it's not. It is on sale too and truth be told I want it for myself. Marble Tray - a decorative tray they can put in their family room, over a coffee table or in their bedroom is another great idea. I love this classic, neutral, light gray marble tray. You can decorate it with anything+everything and it is great for any season or the holidays. Great-Smelling Candles - candles make great gifts for a hostess. If you have never smelled or tried burning one of these Capri candles, you are missing out. They are always sold at Anthropologie and are a little pricey for their $30 price tag, but they are currently 20% off so it's a great time to buy one for a friend, the hostess of the party and for yourself. Plus, what a pretty jar. Lipstick Charger - in this technology world we live in, all of us need a portable USB and phone charger each day. Well, this looks like a pretty lipstick tube and is the same size of a lipstick, however it is an acrylic charger that works both for an iPhone or an android. It also includes an iPhone/lightening cable, Micro USB and type C cable. No wonder it is called a Powerbank. It has great reviews too. Wine Holder - for the wine lover and for any person or couple actually you can never go wrong with a pretty wine holder. One that is small enough to fit into any kitchen, yet can hold a few wine bottles, like the one I selected. I love that this comes with 6 cork wine charms. It can hold 5 bottles of wine and 4 glasses. I love that it says 'Wine' too. But my favorite part is that it can be mounted to the wall. Convenient and pretty, for sure. Charm Necklaces - for a more personal and more thoughtful gift, you can gift her one of these gorgeous silver, quote charm necklaces. They look very similar the necklaces I have worn lately, that my friend makes and sells on Etsy. These are pricey at full price, but are currently over 60% OFF which makes them a steal. I have seen a couple up close and they are truly beautiful. All the quotes are so thoughtful and beautifully-written, too. Boxed Ornaments - it is the right time of year to bring her a set of boxed ornaments. Choose something pretty and elegant. I would suggest glass ornaments as opposed to shatter-free ones. I love the neutral yet feminine and elegant colors of this set of 6 classic see-through glass balls. They run at 4 bucks a piece so the price is right, too. Jewelry Holder - What a pretty mini tree this is. The perfect little tree to hang a few pieces of pretty, dainty jewelry. Makes for a pretty little gift. Whiskey Decanter - not everyone loves or drinks wine. There are people who prefer beer and those who like cognac, whiskey, sherry and brandy. I loved finding this whiskey decanter and that it comes with two glasses. It is such a great gift that is very thoughtful for someone who drinks whiskey. Plus it looks so classic, elegant, classy and rich on a bar cart. It is the perfect drink to bring to a couple, too.